﻿ Environmental- Sustainability NOJIRI METALS CO.
Nojiri Metals, in order to create a better future through resources recycling, make its contribution through sustainable society that aims for harmony between its business and the environment. 1 Promoting metal recycling business, manufacturing and sales of non-ferrous product with minimal impact to environment, contributing to our customer green-procurement and recycling process. 2 Waste reduction while increasing productivity, utilizing resources and energy efficiently to reduce environmental impact. 3 Compliance to applicable laws and regulations. 4 Establishing environmental plans and targets, implementing initiatives to achieve it. Also, regular evaluation and aim for continuous improvement. President of Nojiri Metals Co.
We are also actively engage in environmental activities. 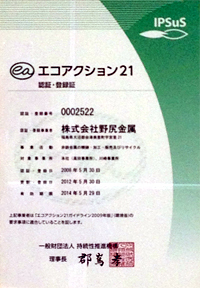 Nojiri Metals acquired the Environmental Management Systems Certification, Eco Action 21 (EA21) in 2008. In 2012, the Kawasaki Plant obtained the certification, and the entire company is actively engage in environmental activities. EA21 is a system designed to create, operate and maintain a system that effectively and efficiently addresses environmental issues, with environmental targets, action, compiling results, evaluation, and report. It is a certification/registration system for businesses based on the EA21 Guidelines formulated by the Ministry of the Environment. For more information : www.ea21.jp (in Japanese). As part of the activities for EA21, we have compiled and published the environmental activity report as followed.